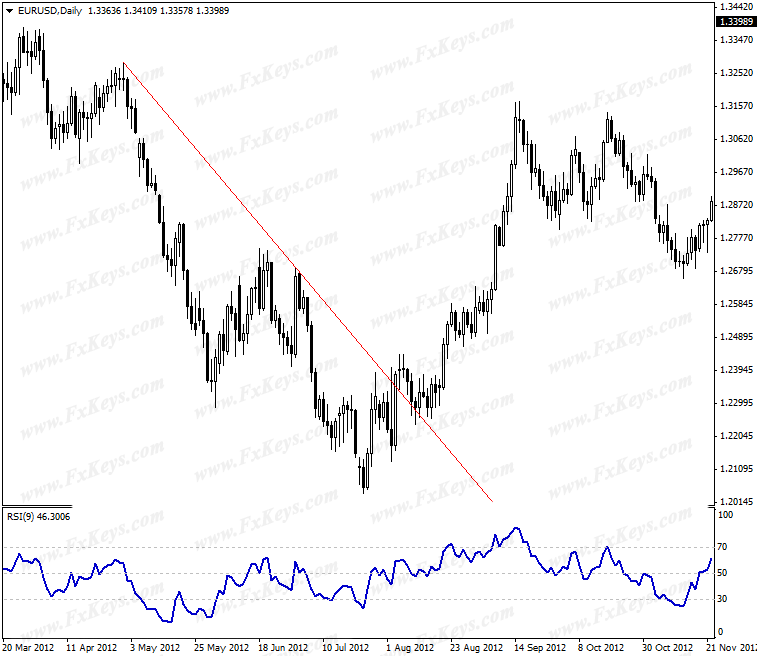 These lines work as the RSI support and resistance levels. RSI ranges from less than 30 to over 70. When it is below 30, the market is oversold. When it is above 70, the market is overbought. I will talk about the RSI overbought and oversold territories in a separate article. In this article, I am going to talk about the 50 level that sits between the 30 and 70 levels. 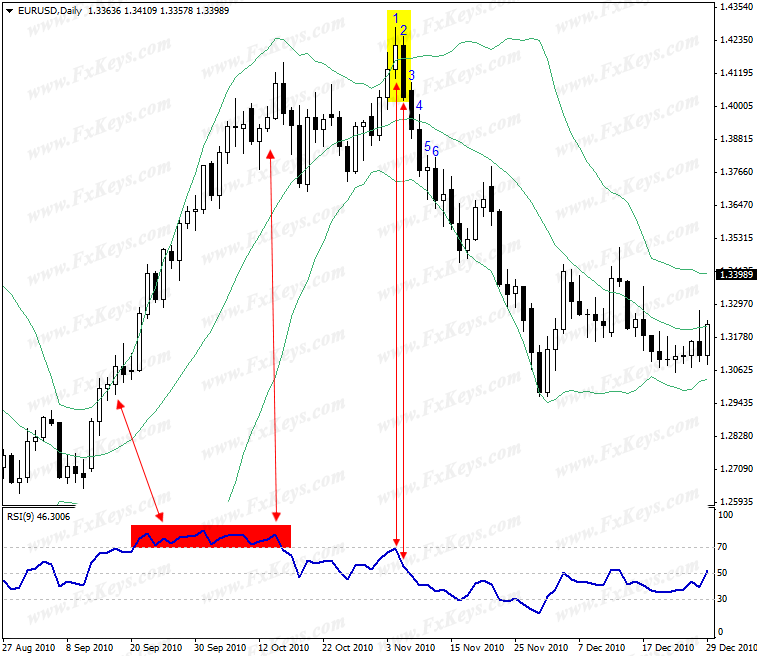 RSI 50 level can be used as a strong tool to confirm the different kinds of trade setups from any trading system. Whether you use the candlestick patterns, support/resistance breakout, or any other trading system, you can consult the RSI 50 level to confirm your trade setups. Let me show you some examples. Note: RSI’s default setting is 14, but the RSI setting we use is 9. The below screenshot shows a strong uptrend that reverses after forming a very strong bearish engulfing pattern (the yellow zone). This is how RSI gives a strong confirmation for a candlestick pattern. 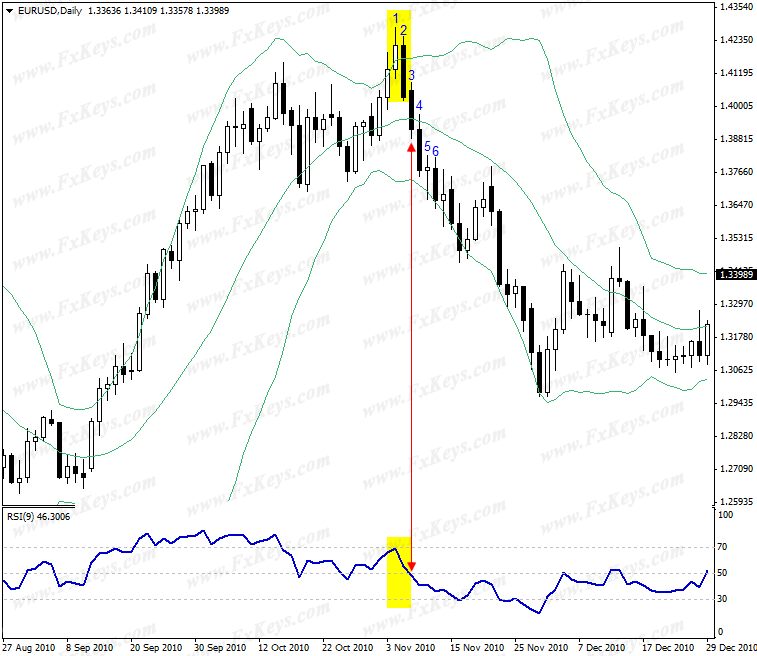 RSI is a very intelligent and smart indicator, and it gives a lot of useful information about the markets. Compare the above example with so many other weak candlestick patterns that are not confirmed by RSI. For example, before the above bearish engulfing pattern, we have so many bearish candlesticks (they have a black body) formed that could be considered as bearish reversal patterns, however none of them are confirmed by RSI the way it is explained above. Now, let’s say you either missed the above bearish engulfing pattern to go short, or you don’t trade based on the candlestick patterns, and for example you trade based on the technical analysis and support/resistance breakout. Or you consider the candlestick patterns, but you enter only when they are confirmed and followed by a technical analysis event like a support or resistance breakout. In this case, you would not go short after the above bearish engulfing pattern, and you would do it – for example – after a support breakout. But the question is could that support breakout also be confirmed by RSI? The below screenshot shows a small support line that was formed on the chart before the above bearish engulfing pattern. This support line was broken by the candlestick #4. You might wonder whether the support line was a valid and reliable support line, and its breakout was valid and reliable enough to go short or not. RSI and then the candlestick #5 and #6 could answer this question. I am going to show you a long trade setup now. Let’s get closer to see how the resistance was broken and retested, and how RSI confirmed the resistance breakout and the bullish movement that took the price up for 830 pips. Follow the candlesticks numbers on the below chart. As you see, candlestick #1 closed above the resistance line. For me, that downtrend was too strong to be reversed so easily. So I would not trust the resistance breakout if I wanted to trade based on the technical analysis and resistance breakout. I need more confirmation. RSI confirmed that the resistance breakout was valid, because it had moved up from the oversold area (the red zone) to the 50 level area and when candlestick #1 closed, RSI had already broken above the 50 level. Just because the downtrend was too strong, the broken resistance was retested very strongly by several candlesticks, before the price goes up seriously. Look at the candlesticks #2 and #3 and the way they retested the broken resistance, and how the broken resistance worked as a strong support and did not allow any of these candlesticks to go down and close below it. Finally, candlestick #4 closed as a bullish candlestick above the broken resistance, indicating that most probably the price wanted to go up. Candlesticks #5 and then #6 strongly confirmed that bulls had taken the control. The price went up for 700 pips after the candlestick #6 formed. While the price was retesting the broken resistance, RSI also retested its 50 level, and when candlestick #5 closed, RSI went up and never touched the 50 level anymore, which means it was the time for the price to go up strongly. This is how the RSI 50 level help us confirm our trade setups. 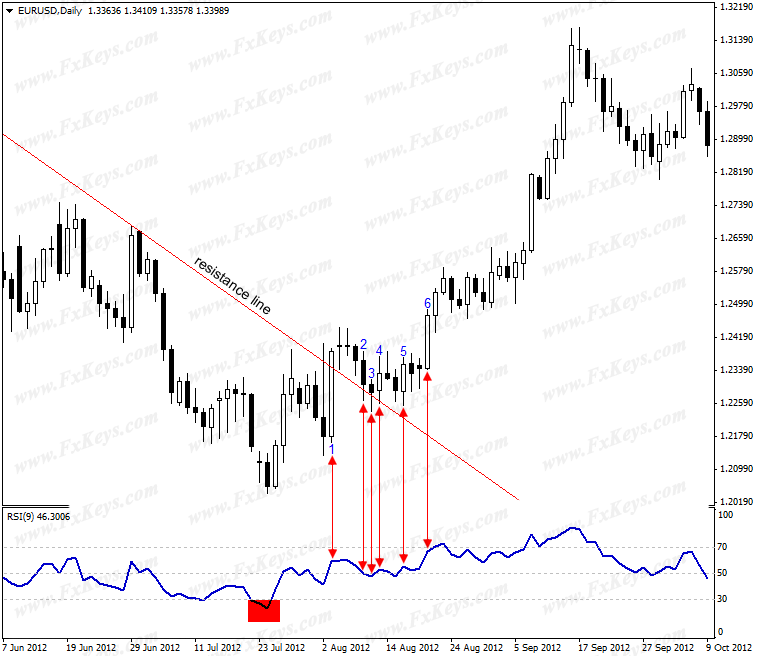 Try RSI(9) with your own trading system and see if it can confirm the trade setups or not. I had to employ a lot of self discipline to clear my charts of many indicators and oscilators after you taught us that candle sticks combined with BollingerBands are the only leading indicators and MACD is the best way to confirm a trade setup. It is confusing, one of these days I will have a lot of clutter on my charts again and spend hours analysing al of it. 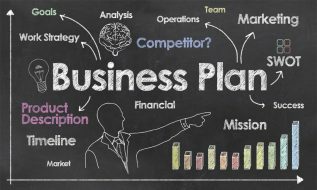 Is this part of the trading plan tat you are teaching? 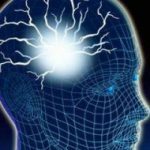 I wrote a few articles about RSI because it is the last article that I believe it works. I have emphasized here that I do not use it personally and I do not even have MACD on my charts. However I thought maybe some traders like to have an extra confirmation for the candlestick patterns they locate. So that they can either use MACD, or RSI. If you are comfortable with the candlesticks and BB, then you don’t need any other thing. I am just concerned that the impression is created that if the one indicator doesn’t confirm the trade setup then you look for one that will. That is a bit like playing the fruit machines at the casino…RSI and MACD does not always confirm each other or the same trade setup. I am not shooting down your articles, you are still the best coach available on the www, and, you’re FREE! Hi, nice article, thank you. I try to trade only with BB and candlesticks like you. I would like to ask you, how many trades you did this August? I have taken 5 position in one of my account and 4 with the other one. The number of positions is not impressive, but the result is great. I am used to this trading style and I can not change it. GBP/CAD and AUD/JPY were the last positions I took. I will do my best to post the setups I locate. I am thinking about having an organized signal program and I have already started consulting with my friends. That is very good Idea. I am also thinking of making a facebook page (like you suggested in another post ) and post all my daily analysis and encourage others to do it. 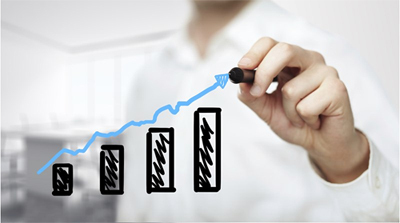 With group, the chances of finding good setup will be even great and reward is multiplied. You have shown an alternative way of trade setup confirmation by RSI 50 level analysis,other than confirmation candle. That is great. In the above article posted on 17th August, 2014, in the first example that you have cited above, based on that can anybody presume that if RSI 50 level do not already have break up 50 level , then the candle stick #3 (confirmation candle) has the maximum probability to go for retest without confirming the bearish engulf ? If so it would be another easy way to set a long trade with the candle stick #3 (confirmation candle) while it was forming. Thanks…. It’s more important post….. Commenting on the RSI settings.14 compared to 9.RSI is a lagging indicator,as others are.The 9 picks up the pace a little.Price action being the primary along with patern analysis and BBands.RSI I look at lastly as a small helper. There is no special reason. It works better than the other settings. RSI9 is the best for those time frames too.